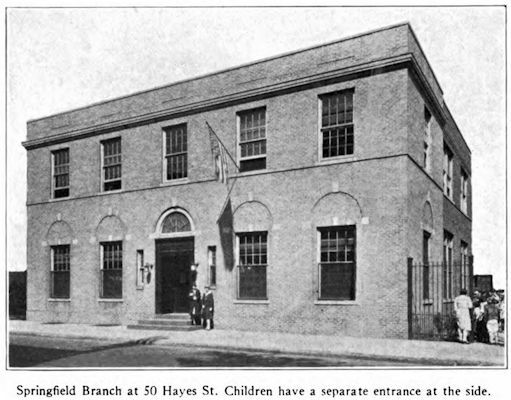 The Springfield Branch of the Newark Public Library was opened in 1923. It is a two story cream brick building of the Colonial style. The building cost was $68,006. The first floors houses the Adult Department, staff & work rooms. The entire second floor houses the Children's Room. The rooms are finished in oak with plaster walls and hardwood floors. Each rooms contains one museum case with a traveling exhibit provided by the Newark Museum. There is a collection of about 22,000 books in which children borrowed 123,401 and adults 63,559. A little over 10% of the books lent to adult readers are in foreign languages, 66% fiction, & 20% non-fiction. The collection of foreign books is well used, Polish leading the list, Yiddish second, and in smaller numbers, German, Rumanian, Hungarian, Italian, Ruthenian, French & Hebrew.